Dr Allan Ure died in December 2005. In recognition of his great contribution to atomic spectrometry and environmental chemistry, the Atomic Spectroscopy Group of the Royal Society of Chemistry and Atomic Spectrometry Updates decided to jointly award an annual bursary in his honour. 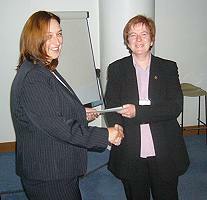 The first award was made in July 2006 at the 13th Biennial Atomic Spectroscopy Symposium in Glasgow to Joanne Wragg of the British Geological Survey and was presented on this occasion by Dr Christine Davidson from Strathclyde University, a former co-worker of Allan´s. Full details of the award scheme and how to apply. 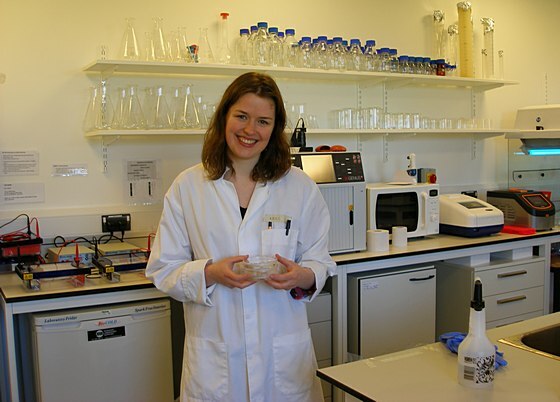 Congratulations to Ásta Pétursdóttir, a third year Ph.D student at the University of Aberdeen, who was awarded the 2013 award. Ásta, originally from Reykjavik, Iceland, has been studying the speciation of arsenic in seafoods, a collaboration between the Icelandic Food and Biotech R & D Company Matís and the University of Aberdeen in Scotland. She intended to use the bursary to attend the 5th International Symposium for Trace Elements in Food (TEF-5) in Copenhagen, Denmark in May 2014. Two equally eligible candidates presented themselves for the 2012 award. As a result, the committee decided to award bursaries to the two candidates - Patricia Coelho of the University of Surrey and Adriana Matamoros-Veloza of the University of Leeds. Patricia has been working towards a PhD on environmental and occupational exposure to mining residues. She has been using different atomic spectrometry techniques in order to analyze blood, urine, hair and nail samples collected from exposed populations. She intended to use the bursary to enable her to make an oral presentation at the 9th International Symposium on Environmental Geochemistry held at the University of Aveiro, Portugal. 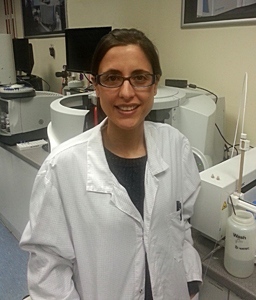 Adriana obtained her Ph.D. in the Department of Environmental Geochemistry at Leeds in January 2012 on the subject "Inorganic pathways controlling selenium mobility in natural environments". She continued to work at Leeds providing technical support in analytical environmental chemistry to ongoing projects in the Environmental Geosciences Research Group. 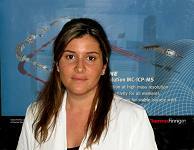 The bursary would help Adriana present her research at the 29th International Conference of the Society for Environmental Geochemistry and Health, in Toulouse, France in July 2013. The 2011 award went to Bushra Al-Wahaibi, a Ph.D student at the University of Strathclyde. Bushra was doing research on the human bioaccessibility of potentially toxic elements in soils using different extraction methods. The bursary was intended to help Bushra to spend a week at the British Geological Survey in Keyworth, Nottingham (UK) with Dr Mark Cave and Dr Joanna Wragg who are also involved in studying human bioaccessibility and are leading experts in this field. Incidentally, Joanna was the first recipient of the Allan Ure Bursary in 2006. There was no award in 2010 as there were no applicants. 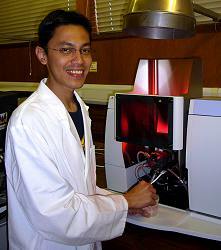 The 2009 Allan Ure Bursary has been awarded to Azlan Kamari, a PhD student at the Environmental, Agricultural and Analytical Chemistry Department, University of Glasgow. Azlan is studying the remediation of water and soil contaminated by heavy metals and evaluating the potential of chitosan and its derivatives to remove heavy metals. He is using atomic absorption spectrometry (AAS), energy dispersive X-ray analysis (EDXRF) and fourier transform infrared (FTIR) analysis in his studies. 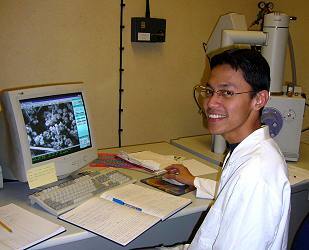 Prior to visiting Glasgow for his Ph.D., Azlan was a lecturer in the Chemistry Department at the Universiti Pendidikan Sultan Idris, Malaysia. He intends using his bursary to attend the 15th International Conference on Heavy Metals in the Environment (ICHMET), which will be held at Gdansk University of Technology, Poland in September 2010. He will be presenting his paper on "The potential of chitosan and chitosan derivatives as amendments in the remediation of soils contaminated by heavy metals". The 2008 annual Winter Conference on Plasma Spectrochemistry, with more than 600 attendees from both academia and industry, took place from the 6th to 13th January 2008 in the picturesque wine-growing region of the Temecula Valley, California (60 miles from San Diego). The gathering was a great opportunity to meet international scientists experienced in applications, instrumentation, and theory related to plasma sources. The meeting aims to examine recent progress in the field and to stimulate discussion of research interests with experts from all around the world. On Tuesday 8th January, I gave an oral presentation reporting the development of novel approaches for pharmaceutical counterfeit detection combining high accuracy stable isotope ratio measurements and trace metal profiling. A case study for an antiviral drug was discussed and the potential of isotopic fingerprinting to provide forensic evidence was highlighted. During the week in Temecula Valley I also got the chance to explore the area, discover the seals at La Jolla Beach, have lunch at the famous Coronado Hotel overlooking the Pacific Ocean and enjoy Californian winter warm weather. Many of those "international scientists" have now also become friends and the conference was also a great chance to catch up with many of them and discuss future collaborations. Once again, I would like to thank the Executive Committee of the Atomic Spectrometry Updates for offering me the Allan Ure Award 2007. Receiving this bursary has been of great benefit to my career. Moreover, it has been a great honour.